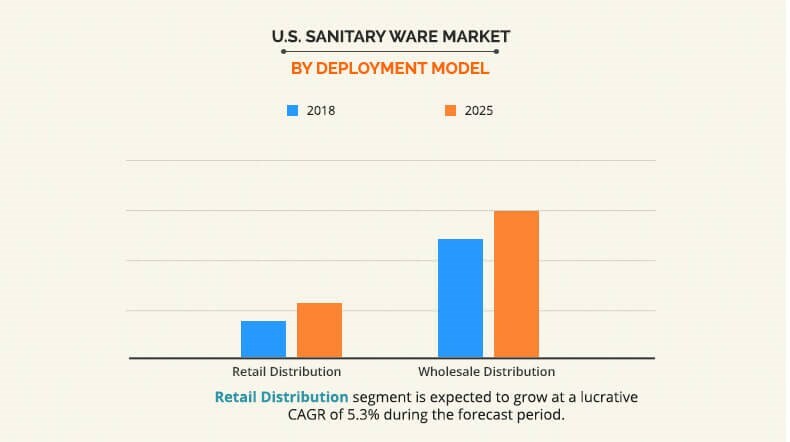 The U.S. sanitary ware market size was valued at $4,168 million in 2017 and is expected to reach $5,687.3 million by 2025, registering a CAGR of 4.0% from 2018 to 2025. Sanitary ware refers to products used in bathrooms and kitchens. These include wash basins, toilet sinks, pedestals, and cisterns. Traditionally manufactured using porcelain, a ceramic material, is now available in wide variety of materials such as metals, glass, and plastics. However, the ceramic sanitary wares have excellent resistance to chemical attacks, are cost effective, and are able to withstand heavy loads as well. Sanitary wares have evolved from being a necessity to a status statement. Thus, expenditure on sanitary ware products have increased manifolds in the past few years. This is attributed to the change in lifestyle of people that is fueled by the growth in per capita income. The toilet sinks segment dominated the overall U.S. sanitary ware market share in 2017 and is expected to remain dominant during the forecast period. Dual flush toilets with sink integrated functioning both as a wash basins and toilet gain huge popularity in the region. Furthermore, motion activated lids, heated seats, integrated bidet, deodorizer, and air dryers are now being incorporated in the toilets. 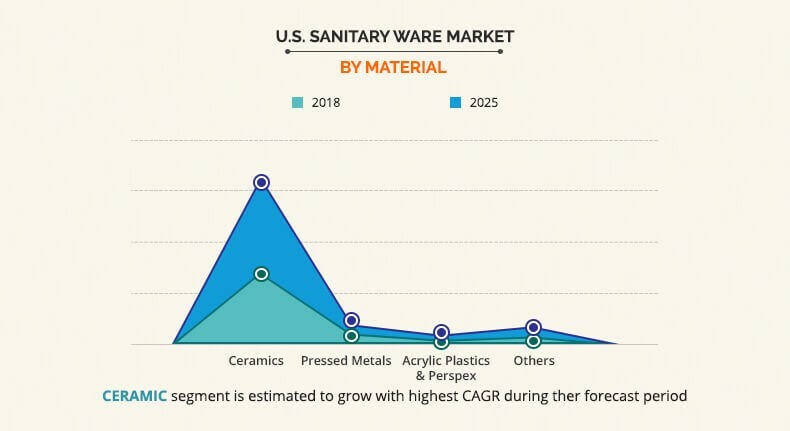 The ceramic segment is expected to exhibit significant growth rate in the U.S. sanitary ware market during the forecast period. The growth of this segment is mainly attributed to its easy-to-clean, smooth surface, along with enhanced hygiene standards and high resistance toward chemical acids, hydrochloric compounds, or strong cleaning fluids. Ceramic is the most preferred material for manufacturing high-quality sanitary fittings due to its pleasant appearance and versatility. The wholesale distribution channel generated the highest revenue share in 2017; however, the retail distribution segment is anticipated to grow with a higher CAGR during the forecast period. The growth of retail distribution segment is mainly attributed to the emergence of bathroom boutiques and online channels in the U.S. region. The residential sector dominated the overall U.S. sanitary ware market in 2017 and is expected to exhibit significant growth during the forecast period. Increase in propensity to live in single-family housing for people aged between 30s and 40s, contributes significantly to the growth in demand for single-family housing, which in turn have increased the demand for new house sales; and thus, positively impacts the U.S. sanitary ware market growth. The report focuses on the growth prospects, restraints, and opportunities of the U.S. sanitary ware market. The study provides Porters five forces analysis to understand the impact of various factors such as competitive intensity of competitors, bargaining power of suppliers, threat of substitutes, threat of new entrants, and bargaining power of buyers of the U.S. sanitary ware market. The U.S. sanitary ware market is segmented based on product type, material, distribution channel, and location. Based on product type, the market is divided into wash basins, toilet sinks, pedestals, and cisterns. Based on material, it is classified into ceramics, pressed metals, acrylic plastic & Perspex, and others. Based on distribution channel, it is analyzed across retail distribution and wholesale distribution. Based on location, it is bifurcated into commercial and residential. The ceramic segment is expected to account for the major share in the U.S. market throughout the analysis period. This segment is also expected to witness the highest growth in terms of value as well as volume during the forecast period. Some of the key players in the U.S. sanitary ware market are Geberit AG, LIXIL Group Corporation, Jaquar Group, HSIL Limited, LAUFEN Bathrooms AG, CERA Sanitaryware Limited, Corona, Kohler Co., TOTO Ltd, Lecico Egypt, Masco Corporation (Delta Faucet Company), Elkay Manufacturing Company, Fortune Brands Home & Security, Inc., Villeroy & Boch, Duravit AG, and USCT Bath. Current and future sanitary ware industry trends are outlined to determine the overall attractiveness of the U.S. sanitary ware market. Top impacting factors highlight opportunities during the forecast period. 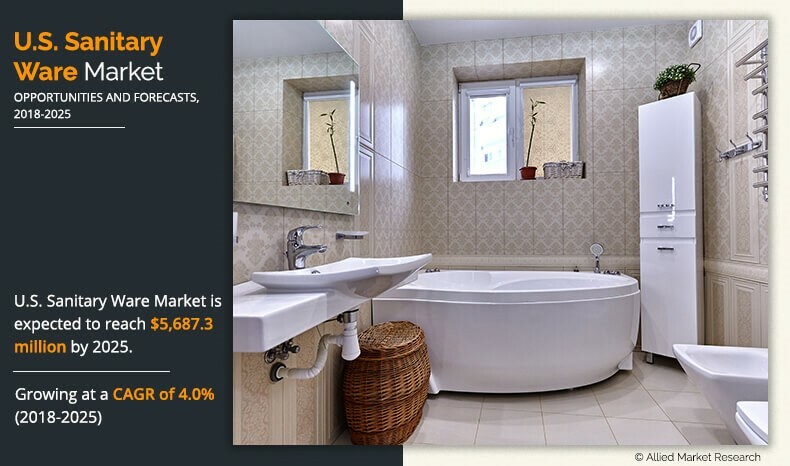 Factors such as rise in new home sales and increase of concept bathroom drive the market growth. In addition, online retail is also one of the major factors that fuels the growth of the U.S. sanitary ware market. However, stringent government regulations and environmental policies are some of the major factors that hamper the U.S. sanitary ware market. 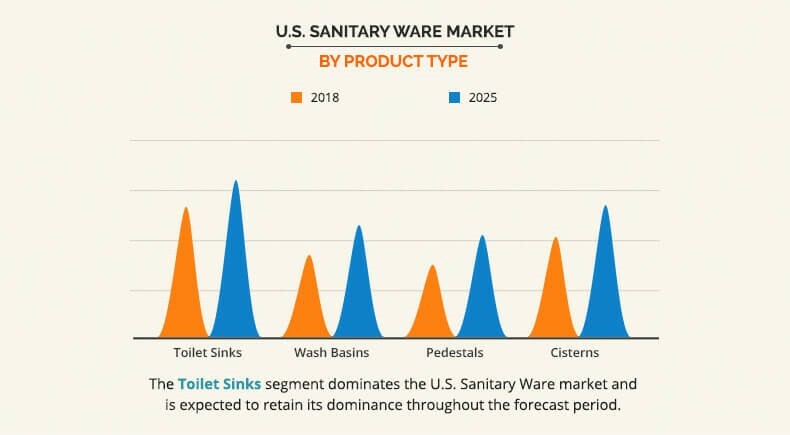 Backed by economic growth, the U.S. sanitary ware market has experienced a robust growth in past few years owing to increase in demand for concept bathroom, rise in disposable income and expansion in residential sector. New trends of concept bathroom and eco-friendly sanitary ware and customization augments the sanitary ware industry growth. Furthermore, new water saving technologies and sustainable material for sanitary ware further propel the market growth. There is a global shift in what people expect from their living spaces, including washrooms to rejuvenate and relax from an increasingly hectic lifestyle. As a result, the concept of a bathroom has evolved from its primitive utility. Now-a-days, bathrooms are equipped with sophisticated range of solutions including but not limited to customized faucets, smart shower systems, countertop basins with thin rim thickness, and other easy to maintain, robust, and impact resistant sanitary ware. Concept bathrooms gain wide traction in the last few years; consequently, increasing the importance of in-store experience. Engaged stakeholders in the industry have established experience centers where a customer can view a virtual version of their bathrooms post completion. The sale of sanitary ware through online channels is very weak; however, there lie colossal untapped opportunities. Online attractiveness of sanitary ware products is mainly driven by the price transparency. Furthermore, ease of finding product online with wide variety in terms of shape, size, material, and design have provided great convenience. Convenience is an important consideration for millennials on account of their hectic lifestyle. Ultimately, manufacturers who are in a position to act and innovate on digital platforms capitalize on the opportunity of sanitary ware sales through online channels. The report provides an extensive analysis of the current and emerging U.S. sanitary ware market trends and opportunities. 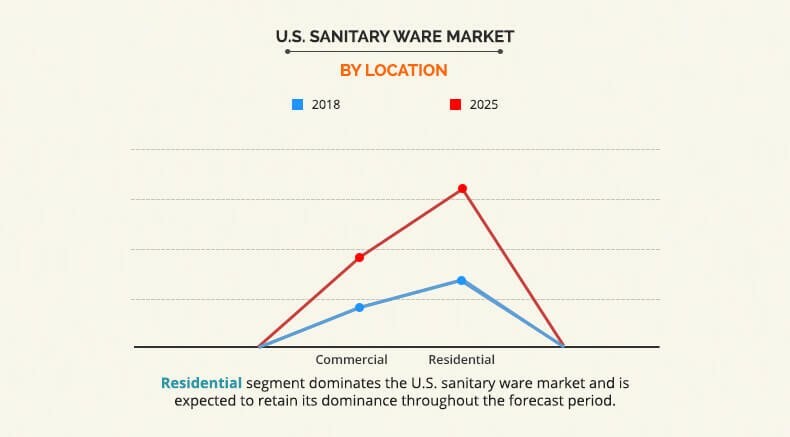 U.S. sanitary ware market forecast is offered along with information related to key drivers, restraints, and opportunities. The market analysis is conducted by following key product positioning and monitoring the top competitors within the market framework. 8.13. Fortune Brands Home & Security, Inc.
Sanitary ware refers to products used in bathrooms and kitchens. These include wash basins, toilet sinks, pedestals, and cisterns The U.S. sanitary ware market is still in growth stage, and is expected to witness robust growth in the coming years. Expanding residential and commercial infrastructure along with rising trend of customization to aid market growth in the region. Furthermore, introduction of innovative products such as intelligent toilets, dual flush, stain-resistant ceramic technology and shower toilet will further augment market expansion. Also, there lies colossal untapped opportunities for online distribution channel. Online attractiveness of sanitary ware products is mainly driven by the price transparency. Furthermore, ease of finding product online with wide variety in terms of shape, size, material, and design have provided great convenience for the customers. Engaged stakeholders in the industry needs to act and innovate on digital platforms to capitalize on the opportunity of sanitary ware sales through online channels.